Reimbursement schemes have also failed to adjust, as most EMS agencies receive payment from insurers based largely on transportation to the hospital, rather than the health care services provided. Simply put, the existing EMS response model has failed to evolve as community needs for emergent and non-emergent health care delivery have changed. Recent efforts in health care to improve quality and reduce costs, including the Affordable Care Act, pose significant challenges to the existing EMS response model. Health care payers have become increasingly unwilling to reimburse for services that fail to prove their value. As a consequence, EMS agencies will soon be required to demonstrate their worth like never before. At the same time, local governments continue to confront the economic realities of stagnant and even shrinking budgets. 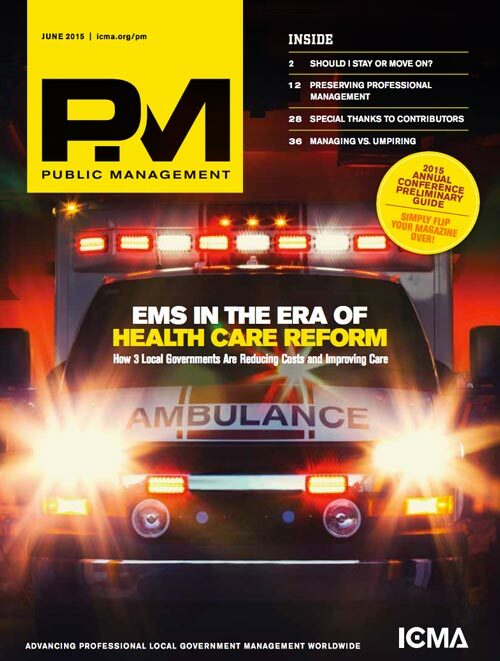 It’s critical for city and county managers to know that despite these challenges, the changing health care landscape also presents opportunities for EMS systems to evolve from a reactive to a proactive model of health care delivery—one that better meets the needs of their communities by preventing unnecessary ambulance transports, reducing emergency department visits, and providing better care at a lower cost. Fee for quality versus fee for service and value-based payments. Currently, most of health care works like a restaurant menu: The more you order, the more you (or your insurer) pay. Unlike a restaurant, however, consumers often don’t know whether the services are any good, are often ignorant of the costs, and sometimes aren’t aware that other options exist. few days later, their physician or the hospital treats them a second time and charges for the second visit—in some ways, making more money because their initial efforts were unsuccessful, whether or not that failure was preventable. In a fee-for-quality model, the goal instead is to reward providers and hospitals who keep patients healthy by treating problems efficiently and effectively. There are different combinations of these two models, but the current health care system still relies heavily on fee for service. One example of Medicare’s attempt to tie reimbursement to quality is the penalties that hospitals face for high rates of readmission for certain conditions. In the past, when a pneumonia patient who was sent home from the hospital returned two weeks later, the hospital could bill in full for treating the patient a second time. Now, in an effort to encourage hospitals to ensure the patient is able to remain healthy once he or she leaves the building, that return visit will also result in a financial penalty. The hope is that hospitals will now spend more time making sure that patients are prepared to go home, by providing adequate discharge instructions and ensuring such proper follow-up care as doctor’s visits, prescription medications, rehab, and home health. While the impact of these changes on EMS remains unclear, the head of the U.S. Centers for Medicare and Medicaid Services (CMS; CMS.gov) has publicly stated that the goal is to shift the payment system to a largely fee-for-quality model. That will impact EMS indirectly as hospitals and other health care providers shift their focus from volume to achieving certain metrics, and possibly also directly if CMS adjusts payments for emergency medical services to include quality metrics or value based purchasing. The concept of community paramedicine—employing EMS providers to provide a broader array of services and focus on prevention and primary care—is not a new one, but it has gained renewed focus in recent years, thanks in large part to the advent of the Triple Aim and the Affordable Care Act. Community paramedicine was initially developed as a way to provide basic primary care services to rural areas with limited medical resources and to avoid long, expensive trips to distant hospitals for minor problems. Urban and suburban communities have begun to experiment with a new type of community paramedicine, which some are now calling mobile integrated health care. Mobile integrated health care is broader than community paramedicine in that it contemplates using providers and organizations of all types to provide the best care in both the home and other nonclinical environments.2 MIH programs often employ EMS providers who receive advanced training on such topics as chronic disease management and mental health issues, but whose technical and medical scope of practice remains unchanged. Among some EMS leaders, there is a concern that EMS agencies are diving headfirst into mobile integrated health care without a clear path to sustainability—even while there is also growing agreement that the current EMS response and funding model is not sustainable. As with any service delivery, local governments should assess community needs; available resources; and the financial, political, and regulatory climate before deciding which type of mobile integrated health care services, if any, are appropriate for their particular communities—and also who should provide those services. In any case, mobile integrated health care programs will not eliminate the need for emergency medical response or the use of EMS as a safety net by some members of a community. 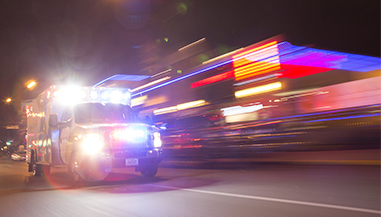 Here are three local government examples of how three different types of EMS systems have implemented integrated health care programs. In 2013, MedStar EMS, the sole provider of nonemergency and emergency ambulance services in Fort Worth and 14 other surrounding cities changed its name to MedStar Mobile Healthcare. The new moniker reflected a realization in the EMS community that 911 calls do not always result in emergency medical care so much as unscheduled health care. The provider has been one of the most aggressive innovators in the realm of mobile integrated health. As a public utility system, it has a government-mandated monopoly of EMS services in the community but also the flexibility to adapt. Nurse triage of low-acuity 911 calls to avoid ambulance transports to the emergency department when not medically necessary. An EMS loyalty program to reduce EMS and emergency department use by frequent users. Readmission avoidance to prevent return visits to the hospital within 30 days of discharge. Hospice revocation avoidance to prevent unnecessary hospital visits for hospice patients. Home health partnership to provide after-hours care. Patients in the High Utilizer Group who graduated the program had an 84 percent reduction in use of 911. Readmission rates for patients in the program were reduced by more than 90 percent. The Mesa Fire Department recently acknowledged the shifting priorities of the fire service by changing its name to the Mesa Fire and Medical Department. The department also received a $12.5 million Center for Medicare and Medicaid Innovation (CMMI) award to expand its Community Care Units program. This program partners paramedics with other health care providers to provide appropriate care to patients at the scene, keeping other department resources available to respond to emergency calls. The innovation awards were established by the Affordable Care Act to fund programs that would test innovative ways to provide better care and reduce costs. The department’s Community Care Units look like typical ambulances, but are staffed with a combination of senior paramedics and midlevel practitioners in a public-private partnership between the city and a local hospital.4 One unit partners the paramedic with a nurse practitioner or physician assistant, who is employed by Mountain Vista Medical Center. That midlevel practitioner can often handle low-acuity emergencies by prescribing a medication, treating someone’s pain, or even suturing a wound in the field, preventing an unnecessary ambulance ride and emergency department visit. A second unit partners a paramedic with a crisis counselor to respond to behavioral emergencies and determine if a patient might be better served at a psychiatric facility rather than the emergency room. Partnering with these other health care providers has allowed the department to expand the scope of services it can provide in the field. Although Mesa’s program has only recently expanded, the department reports that in 2014, emergency department transports have been avoided for more than half of the low-acuity patients seen by a Community Care Unit. In Wake County, North Carolina, the county EMS agency that provides 911 EMS response and transport added a new level of provider: the advanced practice paramedic. These paramedics receive additional training and supplement the emergency medical response system, ensuring the presence of an additional, experienced paramedic on critical incidents. But the main success of the program has been the use of the paramedics to conduct in-home visits with frequent callers and patients who are referred by other EMS providers when they determine that a patient needs additional services other than emergency transport. Wake’s advanced practice paramedics are also able to medically clear intoxicated patients so they can be taken directly to a detox facility, preventing the use of both an ambulance and emergency department bed for a person without a medical need for either. Similarly, they can evaluate psychiatric patients in the field in order to determine the most appropriate transport destination and arrange the services they need in a more timely and cost-effective manner, often avoiding ambulance transports in favor of police escorts to a psychiatric facility. Unlike Mesa and Fort Worth, Wake County funds the advanced practice paramedic program through the agency’s budgeted funds and not with agreements with hospitals or other payers. The aim of the program is to avoid unnecessary ambulance transports, which may certainly help patients but also increases the efficiency of the EMS system. Changes in health care financing will impact EMS. Already, it is clear that changes in how the Centers for Medicare and Medicaid Services reimburses hospitals have had significant impacts on the health care system. Hospitals now want to avoid having certain patients show up in the emergency department. While the future remains unclear, the Centers for Medicare and Medicaid Services has made no secret of the fact that it wants less fee-for-service and more value-based purchasing. This will create opportunities for EMS to help other health care providers meet this mandate, but it also means that EMS must itself be prepared to demonstrate value in order to survive. EMS must develop relationships with other health care partners. Successful community paramedic and mobile integrated health care programs rely on public-private partnerships with hospitals, physicians, payers, and other members of the health care community. No longer can an EMS agency see itself as independent from the rest of the health care system. Not all mobile integrated health care programs should look the same. Since the passage of the Affordable Care Act, EMS agencies across the country have rushed to start MIH programs. While some have been successful, their long-term sustainability is still unclear. Each community should conduct an assessment to determine its needs, available resources, and what role EMS can play in improving the health of the community. Not every EMS call needs the same response. What mobile integrated health care programs are doing, essentially, is recognizing that EMS providers can provide (and patients require) services other than immediate transport to the ED. In order to truly serve the community, both by providing patient-centered care and fiscally responsible service, leaders should examine whether the services they currently provide match the demands and expectations of those they serve. Health care is evolving at a rapid pace, and EMS agencies can play a significant role in improving the health of their communities and reducing costs. Although the long-term value and sustainability of new programs is still unclear, with so much change occurring, managers and elected officials need to ensure that local EMS services are preparing for the new health care world in a way that meets the needs of their communities. 1 For more information on the IHI Triple Aim Initiative, visit http://www.ihi.org/Engage/Initiatives/ TripleAim/pages/default.aspx. 2 Learn more about MIH at http://mihpresources.com. 3 More on MedStar mobile health care programs can be found at http://www.medstar911.org/ community-health-program. 4 For a presentation on the Mesa, Arizona, program, visit http://www.mesaaz.gov/fire/PDF/ FireHouse_World_2014_Presentation.pdf. 5 Wake County, North Carolina, described its results in an article found at http://www.emsworld. com/article/11289649/advanced-practiceparamedics-and-alternative-destinations.